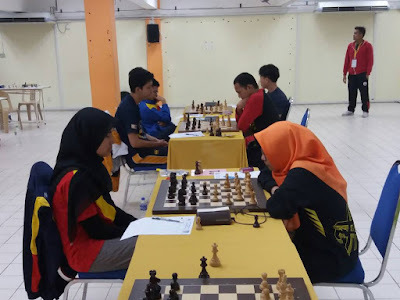 Sudah agak lama GiLoCatur dan keluarga tidak pergi ke Pulau Pinang untuk sertai kejohanan catur. Ada empat kejohanan catur yang GiLoCatur masih ingat disertai oleh anak2 GiLoCatur - Fikri, Anis Fariha dan Fahim Al-Faqeh. Wow! GiLoCatur had not updated this blog more than a month already. Unbelievable. How time flies. 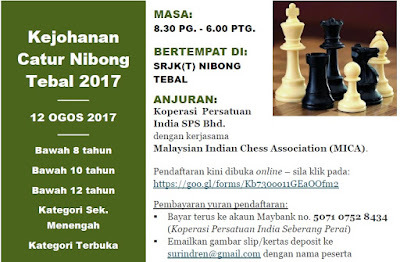 The year 2017 is entering its final half. 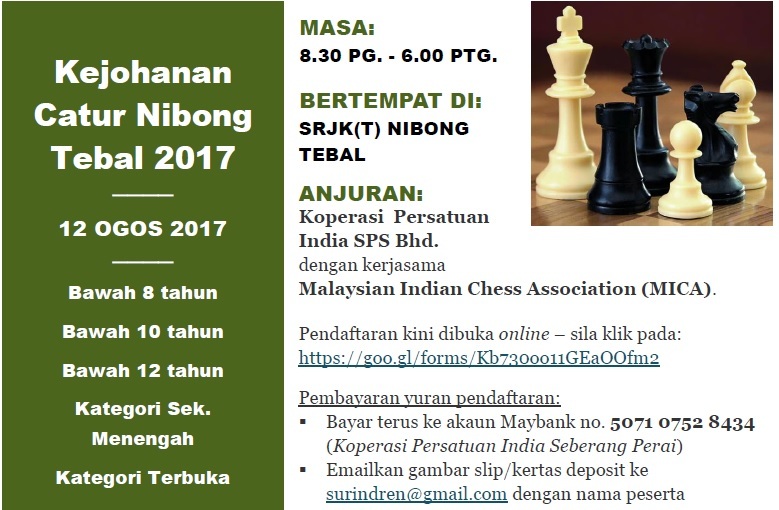 Today GiLoCatur has to take some time to update on MASUM 2017 Chess Championship which is in its third day. 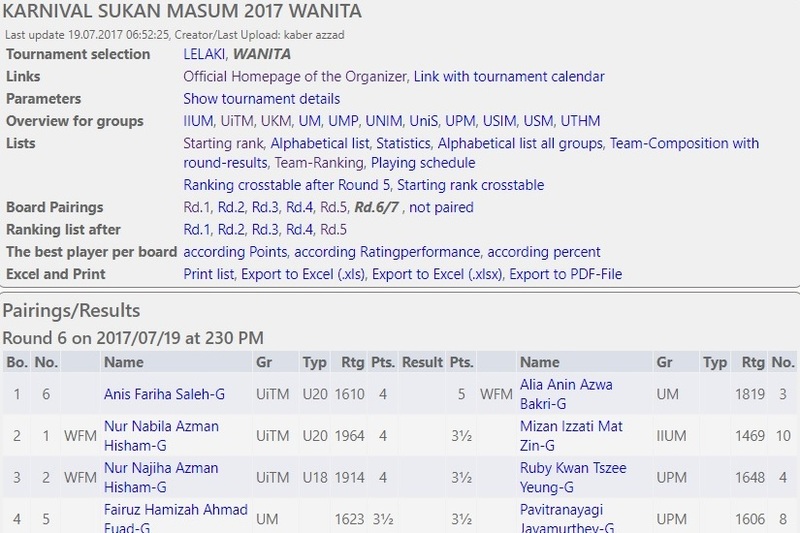 Round 6 is on-going. 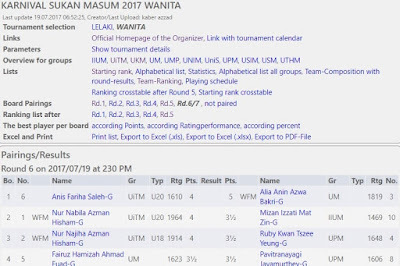 GiLoCatur anxiously following the match between GiLoCaturs only daughter ie Anis Fariha representing her UiTM who is playing on top board against on-fire Alia from UM. 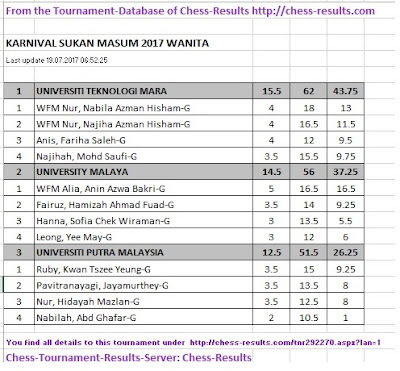 It is really an uphill battle for Anis since her opponent Alia has defeated both Nabila and Najiha. Anyway ALL THE BEST TO GILOCATUR'S DAUGHTER ANIS FARIHA! 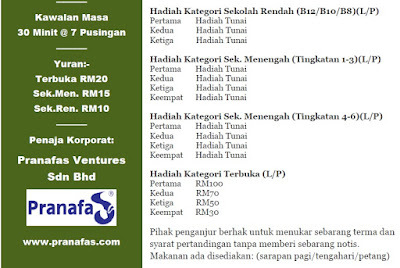 The final 7th round will kick off tomorrow. 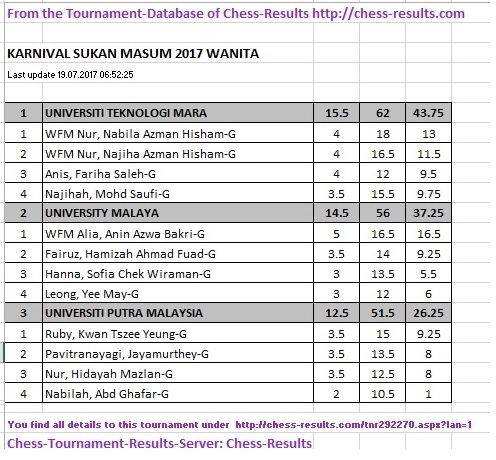 Up to the fifth round, the UiTM Women MASUM 2017 chess team is leading with 15.5 points..